Nintendo revealed a co-op ‘Zelda’ for up to three players, and it’s actually pretty good. It takes three to Triforce. The Legend of Zelda: Triforce Heroes seemingly came out of nowhere during Nintendo’s E3 Digital Event. As a new spin-off for 3DS, Triforce Heroes runs on the Link Between Worlds engine and allows up to three players to explore dungeons and solve puzzles together. It may just be a way to tide fans over while the next, main-series game on Wii U is finished, but Triforce Heroes may be one of the most interesting Zelda titles to release in years. 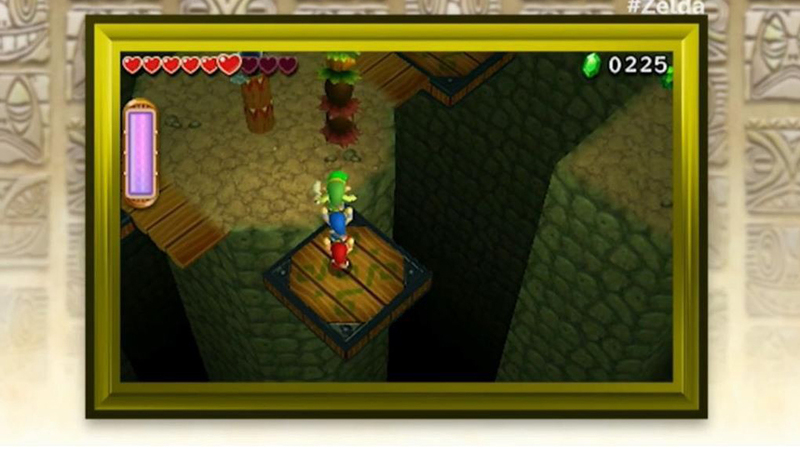 In Triforce Heroes, three heroes claim to be Link, and must work together to survive. In the demo I was shown, the gameplay worked by first having all three players join a lobby, and from there you could choose which area you wanted to explore. The game would then use a roulette wheel to select the area, and then you’d be able to choose a costume. A first for the series, costumes give Link new abilities, such as improved bombs with a suit of armor, or an improved spin attack with a samurai outfit. Link can even get in touch with his feminine side and wear Zelda’s dress if he wants. My group was then transported into the game’s first dungeon, and the Nintendo rep pointed out we’d have to be careful, as we shared the same life-bar. Unlike say, Four Swords Adventures, which allowed four players to compete for rupees and hearts, Triforce Heroes makes cooperation not only key, but necessary. Not only do you and your friends share a lifebar, but you also only get one item each. For instance, one player will have bombs, and another will have arrows. Communication is key to get the right player to the right place to progress. The dungeon itself was pretty fun, and full of the typical, intriguing Zelda puzzles. One room had us forming a “Totem,” where the three Links stacked each other up to reach higher places and light torches. Others had us dodging arrows as we blasted away sections of the wall. Interestingly, the dungeons are structured more like Mario levels, with everyone stepping on a Triforce-shaped pad at the end of the room that transports everyone to the next. The gameplay itself is really solid and clever, just as a Zelda game should be. However, even with both of my partners in the demo standing mere feet from me, we still had trouble coordinating where to go and having people mess up. And since we all shared a lifebar, we ended up cutting it close more than once. Nintendo has already predictably revealed the game will not have voice chat, which could definitely become a problem when playing online. While Nintendo did include clever photos of Link you could send to your partners to communicate with them (move here, push this, etc. ), it’s hard to imagine that will be enough, especially with strangers. Unless you’re in the same room or on the phone with your friends, Triforce Heroes could prove difficult. Overall, I quite enjoyed my time with Triforce Heroes. The dungeons and puzzles were as fun as ever to figure out, and it was even more fun having to frantically work with my partners to clear obstacles, and when we did, there was a real feeling of satisfaction. While the lack of voice chat is an issue, the moment-to-moment gameplay is solid and local play worked flawlessly. The Wii U Zelda might still be a year away, but Triforce Heroes is looking to be more than a great way to pass the time. Do you think ‘Triforce Heroe’s needs voice chat? Are you excited for a co-op ‘Zelda’? Tweet me @MaxMielecki. And be sure to follow us @YouNerded.